Hello Polished People and welcome to my first post of the 31 Day Challenge!!! 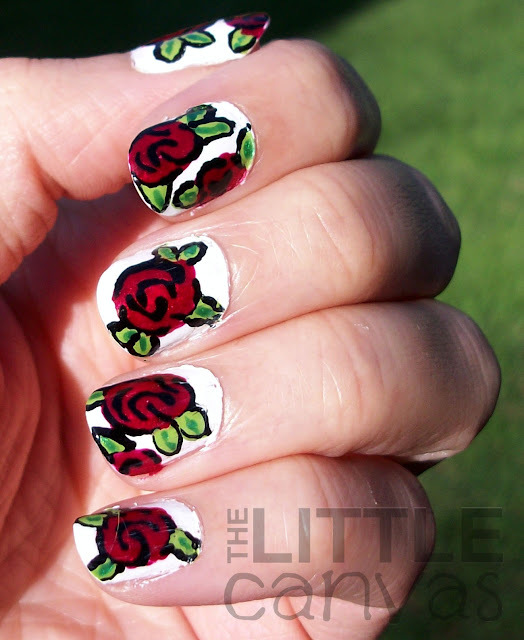 For today's post, I didn't want to do a red based nail, instead I wanted to do a form of nail art which included red. 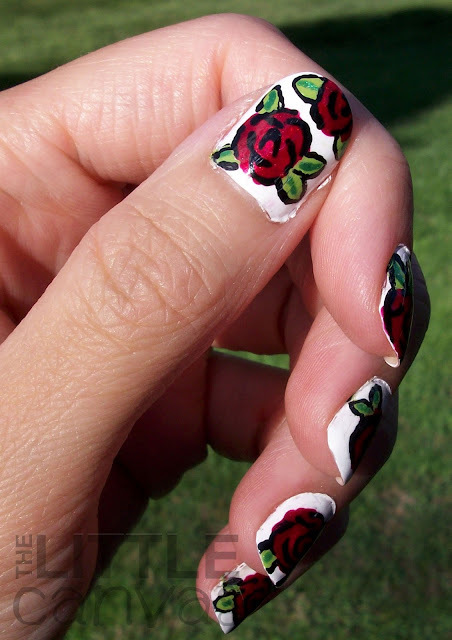 A while back, I had seen a pin on Pinterest which showed a white based nail with pretty pale red roses. 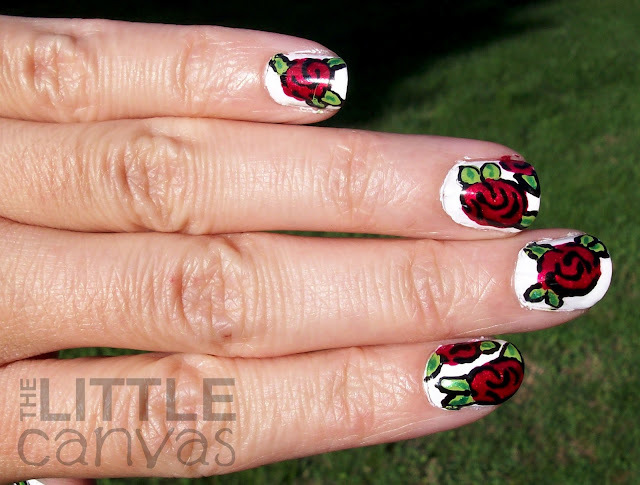 I LOVE floral nail art, especially roses, so I knew I had to do it. Ahhh these nails are so pretty! I'm in love with them!!! I will be doing them again. When I sat down to do the manicure, I was unsure as to which red I was going to use. My choices were Sugar, Sugar, a shimmer red, and Red Carpet Red by Ulta which is a jelly red. After talking it out with a few people, we all decided on the shimmer, and oh how happy I am that I used the shimmer. 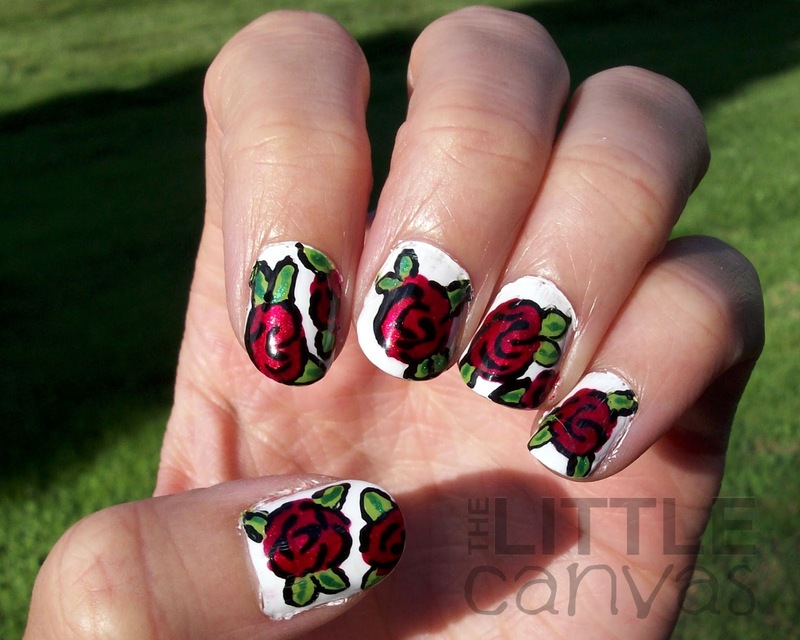 To do these nails, I started with a dotting tool and drew on the roses. I did not do perfect circles because roses are not perfectly round. 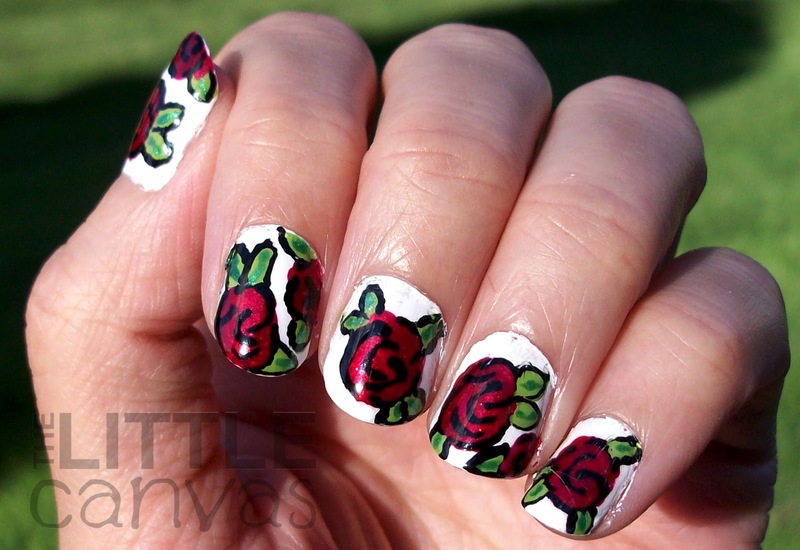 With a toothpick, I then drew on the leaves with Sassy and added the shimmer detail with HD Nails. Once everything was dry, I added the black detailing with a toothpick to make the petals. Originally, I did not have a black outline around the green leaves, and it was not nice looking. Once I added the black though, they popped. I don't know if it was the shimmer polish or what, but the roses seemed to jump off the flat cream white base. I can't even find the words to properly describe how amazing they looked in real life. If you have the colors, or something similar, you all MUST try! Really, I swear, they are not that difficult! Just a bit time consuming, but in the end, so worth it! What is your favorite floral manicure?? As a reminder, this is the 31 Day Challenge! Do not forget to check out the other lovely ladies participating along with me! i loved you nails, but why did you use flowers when flowers are part of the challenge? just wondering? This are gorgeous! No joke, I thought they were nail stickers at first glance. No way I could pull this off. I might try one day soon... we are in the beginning of a challenge after all! I love the designs that you do. I wouldn't be able to do this in a million years. The look of it so vintage which is probably another reason why I like them so much. Thank you so much Cynthia! Yes, they are vintagy looking! I loved them! And i'm sure you could do them!!!! These are amazing! I might have to attempt these soon! thank you!!! if you attempt them, i want to see!!! and thank you! ahhh i've nominated for so many and I've been such a slacker!